Thank you. 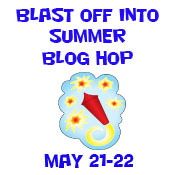 ladies at www.cricutyourclassroom.com and http://lyndascreativetouches.blogspot.com for a wonderful blog hop! I decided to make a bookmark for each of my students. I used the My Pink Stamper stamp set, "Fruit and Veggie Puns" and the Cricut Preserves cartridge. The back of each bookmark is printed so the children can keep track of what books they read this summer. Thanks for stopping by! I am new to blogging, so I would appreciate new followers! Leave a comment for some blog candy- a goody bag from my last shopping adventure! I will draw for the winner Tuesday, May 24th. Becky- http://cricutinmyclassroom.blogspot.com --- YOU ARE HERE! Cute bookmarks. Im a new follower. Those turned out really cute! I love how you have the patience to cut around printed sentiments. You've inspired me to give it a try! I am a new follower ... welcome to the bloggy world. These bookmarks are so cute. I'm a new follower and fellow elementary school teacher. Just love your ideas! I'm ready for summer now ;) This was a fun hop to participate in. Hudson loved having you this year, I'm sure he will love his bookmark. Oh Becky - these are fabulous! i am an avid reader of books - no electronic reader for me - and I love bookmarks! Such a great idea to put a place for them to list their summer reading on the back - LOVE that idea! Great work! I love your bookmarks and as a mother and grandmother, I appreciate all you teachers do. Oh now I am torn! I saw another bookmark today that I thought I would make for my little next door neighbor, but I really like the idea of writing the books he has read on the back of the bookmark, very good idea! I think I am going to make some of both! lol! I am a new follower! I think your bookmarks are wonderful end of the year presents for your students! I've been following your blog for about a month and a half. The bookmarks are perfect for an end-of-the year gift. Now I need to get busy. Thanks for the inspiration. I love these bookmarks because the students are able to track their reading!!!! Thanks for joining in on the blog hopping fun!!!! Love the book marks! But I'm big on reading! Everyone can use bookmarks. Yours are just so bright and cheery. I am your newest follower and hope you will pop in and visit my blog. These are such fun and cute bookmarks! I absolutely love the fruity sentiments! Tfs and have a great a day. Cute bookmarks. Your students will love them:) TFS!I am new follower of yours. Would love it if you would stop by my blog and follow me too:) I look forward to seeing more of your projects! What a nice bookmarks!Good ideea, I will try to. Cute project!Have a great summer from a fellow teacher! What a great gift for your students. I so love projects with puns, your bookmarks are so cute! What a nice idea! Thanks so much for sharing them. I love bookmarks!!!! Great idea! I'm new to this stuff to but it gets easier! Great gift to encourage the kids to continue reading throughout the Summer. I am a follower. Love these bookmarks and what a great idea to have them list what they read over the summer on the back. I will definitely follow your blog. Can't wait to see more cool projects for the classroom. Thinking maybe I should start a blog of all the things we use our cricut for. We'll see. Adorable bookmarkers...I'm a new follower! Your bookmarks turned out great. I really like the idea of being able to keep track of the books that you have read that way too.